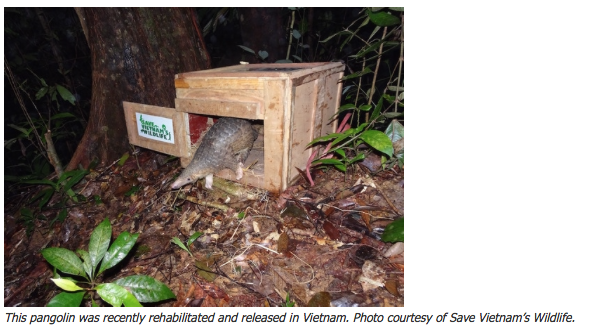 This pangolin was recently rehabilitated and released in Vietnam. Photo courtesy of Save Vietnam’s Wildlife. 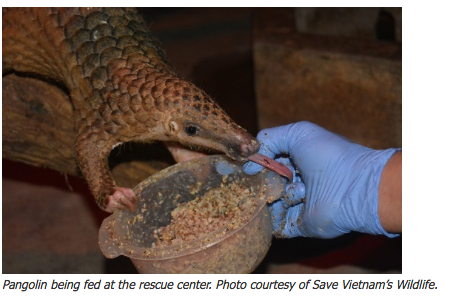 Pangolin being fed at the rescue center. Photo courtesy of Save Vietnam’s Wildlife. Save Vietnam’s Wildlife’s head keeper Hung Tat Luong treks carries a pangolin to the release site. The team arrived just before sunset and the mist was pervasive in this high mountainous area. Photo courtesy of Save Vietnam’s Wildlife. Save Vietnam’s Wildlife teams at the release site. From left to right, Director Save Vietnam’s Wildlife Ngyuen Van Thai, Dinh Van Quyen (keeper), Bui Van Thu (senior keeper), Tran Mai Anh (communications officer), Gillian Fuller (communications and development advisor), Luong Tat Hung (head keeper). Photo courtesy of Save Vietnam’s Wildlife. This article was originally published on National Geographic under the title “Happy Ending for Smuggled Scaly Anteaters.” It is published here with permission. For full article, please click here.